Issue #16 of Ares, released in winter 1983 is the tragic final installment in this magazine's brief history. I say "tragic," because it's a really good issue -- well written and presented and filled with lots of very interesting articles -- that is also its final one. [EDIT: Apparently it's not; there is an issue #17 and I don't own it.] No more stand-alone issues of the magazine would be forthcoming after this one. Instead, Ares would become a section within Dragon. Say what you will about TSR's treatment of SPI and its properties, but I can't help but feel that, when it came to Ares, TSR knew what it was doing. Issue #16 is a fully fledged science fiction periodical that provides just the right mix of speculation, fiction, gaming, and other features. It's almost exactly the kind of magazine I'd have enjoyed back in the day, so it's a double pity that I not only never read this at the time but that it was also, ultimately, a failure. If anyone at TSR knew, when it was putting this issue together, that it would be the last of its kind, they don't let on to that fact. The opening editorial, again by "The Editors," suggests that the magazine's "new look" and more focused content is the start of something big. There is no suggestion whatsoever that the periodical's days were numbered. Indeed, a new letters column is introduced in this issue, implying that, if anything, the folks involved in creating Ares had every reason to expect its continuance. Gone this issue is John Boardman's "Science for Science Fiction" and I can't say I'm sorry. I liked the idea behind the column, but Boardman's authorial voice was to pessimistic and smug to hold my attention. This issue we're treated instead to "Galactic Empires" by Robert A. Freitas Jr. This lengthy article (8 pages plus a one-page supplement) uses a combination of history, sociology, psychology, and speculation to imagine what the foundation and maintenance of a galactic empire would be like. I can't say that it's "realistic" or based on "science fact," but it's a good and inspirational read. It's precisely the kind of thing I had always hoped we'd see in "Science for Science Fiction" but never did, because Freitas, unlike Boardman, hasn't let his skepticism win out over his sense of fun. Though not specifically a gaming article, it's nevertheless useful to referees and players of science fiction games. Poul Anderson (!) provides this issue's fiction installment in the form of "Quest," a short story sequel (of sorts) to his famous The High Crusade. "Quest" is a fine tale about seeking the Holy Grail amongst the stars, and was included in the 50th anniversary edition of The High Crusade published back in 2010, if you're interested in reading it. David Cook provides this issue's integral wargame, also called The High Crusade, which simulates the battles between English knights and the soldiers of the instellar Wersgorix Empire, as depicted in the novel. It's a two-player game in which each participant struggles either to gain or maintain control over a multi-racial, multi-planet empire. As wargames go, it's fairly straightforward, its most interesting element being the inclusion of random events for both sides. These events, I suspect, play an important -- and unpredictable -- role in the progress of the game, making it harder to develop a "perfect" strategy for success. I'd love the chance to play it sometime. "Return of the Stainless Steel Computer" by Ken Ramstead is a short expansion of the solitaire play options of the Return of the Stainless Steel Rat game from issue #10. Roger E. Moore offers "Creating Alien Races for Traveller Game Adventures," in which he talks about and gives an example of the process -- the unfortunately named Sydymites from Judges Guild's Ley Sector. The funny thing is that I had a photocopy of this article back in the '90s, when I was deeply involved in Traveller fandom, and used it as a template for creating my own alien races. Moore has second article, "Swords and Stars," which expands on the barbarian career option from Traveller's Citizens of the Imperium. Greg Costikyan continues to review books, while Steve List does the same for games, including my much-beloved Star Trek The Roleplaying Game. Christopher John likewise review movies, most of which he hated, especially Krull and Superman III. I can't say that I disagree with his judgments on either score. David J. Schow talks about the process of creating movie novel tie-ins, which is actually quite interesting. Roger Raupp offers up the second (and last, as it turns out) installment in his science fiction comic, "Ringshipper." And that brings us to the end of this issue and, unfortunately, the end of Ares magazine. As I stated when I began this series, I was only vaguely aware of the existence of Ares during the time of its publication, so I never had the chance to read these back then. Doing so now has been enlightening, but it's also been mildly depressing, both because I think Ares had unrealized potential and because I am reminded of the deaths of many other gaming periodicals that I did read in those days. While the Internet provides a great deal of useful content, often for free, I'm enough of an old man to miss print periodicals and mourn their decline. That's why I am so pleased to see the rise of fanzines in the old school community and why I will be starting a new series next week devoted to another forgotten gaming journal of old. What about Ares #17 with the Mongoose & Cobra adventure for the Universe RPG? Until right now, I didn't even realize there was an issue #17, since I don't have a copy. How frustrating. And don't forget the two special editions either. 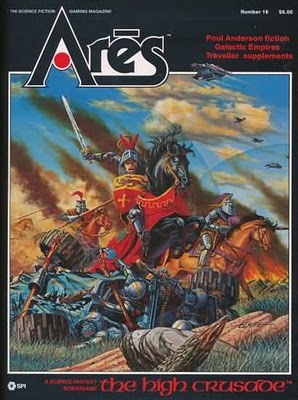 For me _Ares_ was always about the games rather than the magazine, which I generally considered little more than a pretty container to wrap the game in. * It was a cheap and simple method of trying out new and boutique game designs (like it's companion magazine, _Strategy & Tactics_). Apart from the new game, my favourite bit of the magazine was the Feedback "column," because this was where the designers at SPI would float ideas past the public to gauge their response for new games. It was a pure idea fest. Which was the other purpose of both house magazines, and the reason why SPI considered it very important to buy an expensive computer to process these results. But then I was a wargamer before I was a roleplayer, so my expectations were probably quite different. I knew about the special editions, but figured I could forgo them (especially since I don't have copies to those either). A "High Crusades" sequel? Man, I am tracking that down. I'm curious about these fanzines dedicated to the old school community, James. Can you provide some further details on them? I wouldn't mind checking them out.